Hunting is a great sport, one in which hunters tend to follow very strict rituals. Most will rise in the early morning before sunrise and make their way to the deer stand to prepare for first light and the first sighting of a big buck as it rises to feed. There are also some hunters who also follow a dedicated evening schedule, hunting until just after nightfall with visions of grandeur in their head. But is either of these tactics the very best strategy for locating and taking a prized deer? Is one of these times better than others or are there actually other times of the day that will offer the same or better results? To fully understand and answer these questions we must first look at the daily and seasonal habits of a deer—when it feeds, sleeps, roams, etc. By doing just that in the article below we will ultimately answer the question on every hunter’s mind: What are the best times of day to hunt deer? Although the behavior of deer on a day to day basis will change based on the different food sources available at different times of the year, the daily schedule that we have outlined below will give you a general idea on the daily movement habits of a deer during hunting season—usually in the fall. Believe it or not, the day of a deer actually begins about two to three hours before nightfall—before it gets dark. Depending on where you live (or where you hunt), this could be anywhere between about 4:00 PM and 6:30 PM during the primary deer season. During this part of a deer’s day, when they first become active, its greatest priority is finding food. Although deer can be very alert during this time of the day, their hunger might cause them to move toward food sources without thinking of potential hazards, making them very susceptible to hunters. However, once they have begun eating you can expect them to be almost hyper-alert during this time of the day. When the sun sets over the horizon and nightfall begins to set in, deer will remain in this hyper-alert stage. Deer are primarily a nocturnal animal but, ironically, they do not have very good night vision. Of course, we as hunters also have a difficult time seeing in the dark, which is why most states have laws against hunting after nightfall. That being said, once the sun goes down you might want to just head to the cabin for the night or risk a hefty fine or worse. Throughout the night, deer are known to feed lazily, grazing from site to site. Occasionally they will head back to their sleeping or bedding sites around midnight, resting for a few hours before they rise again in the early morning to continue to feed. In the early morning—anywhere from about dawn until about 3 hours after sunrise—the deer will once again head to their sleeping sites to rest. It is during this trek back that most hunters will encounter a deer. Depending on where you are hunting, this can be any time from about 5:30 AM to 10:00 AM. During this time, deer are usually very lethargic and not very alert, particularly those who are returning later in the morning. After deer return to their bedding sites, they will typically sleep until about midday—11:00 to Noon. After awaking, they will usually rise again to feed for an hour or two before heading back to their bedding sites, where they will remain until they rise for their evening feeding. According to experts, the least active period for a typical deer is between 2:00 PM and 4:00 PM. It is during these hours when deer are likely to be resting very deeply. Although this does not always hold true, it is a good model to follow in most regions of the country. Based on this information you know that mornings and evenings are probably the most viable times to hunt. However, there is also a midday period in which deer are feeding of which most hunters seldom take advantage. Of course, this model could change depending on available food sources, temperatures and other variables, but this is the typical daily schedule of a deer during most hunting seasons. We have just looked at a sample of a deer’s daily schedule—a schedule that is basically a back and forth pattern of feeding and resting. But what about the seasonality of a deer’s behavior? Does it change from season to season? The answer is yes. To illustrate this point, below we will take a closer look at the various seasons and the role they play in a deer’s behavior, beginning with the season of spring. Please note that the fall season—the typical hunting season in most states—will get a little more attention in this section than the others. A deer’s movement in the early part of spring will depend upon the severity of the winter that preceded it. If the winter was a harsh one, the deer will begin moving earlier in the day than they normally would and stay out later. Between these hours of the day the deer will constantly be looking for food wherever it can locate it. The fawns are usually weaned off milk in the early spring, and sleeping will be restricted to just 3-4 hours right around midday. In early spring the greatest deer activity will be in the very early hours of the morning and right around dusk. In the mid to late spring things will begin to change a bit in a deer’s normal daily schedule. It is during this time that grasses are abundant and a deer will spend much of its time eating in the same general area. Once deer find a location that offers an abundance of food on which to forage, they tend to remain in that general area, often moving less than a hundred yards in either direction the entire day. The summer months are some of the least active for deer. When the summer sun is blazing, most deer tend to bed down for most of the daylight hours, rarely leaving their bedding sites until well after nightfall. During the night they will forage for a few hours for food, only to return to their bedding sites just after sunup. Younger and more antsy deer may not always follow this exact schedule, as some are known to venture out in the early evening or just about dawn to forage, but this is an exception rather than a rule. In the early fall (think September), deer begin to get active again—sometimes very active. This is a time of abundance and greed for a deer, which will eat voraciously during this time period and travel as far as required to locate and forage on grasses, crops, soybeans and alfalfa. Come mid-fall and the dawn of the hunting season, the deer population in a given area will have settled into a food cycle, eating and resting in spurts, often repeating these cycles three to four times a day. The best times to see deer feeding in the mid-fall are during the very early morning, just around dusk, and about noon, after they have risen from their late morning nap. As every experienced hunter knows, there is a period between mid-fall and late-autumn in which deer begin to behave erratically and unpredictably. This period, which in hunting circles is known as the “rut,” causes the most problems for hunters because the schedules of a deer or very haphazard. 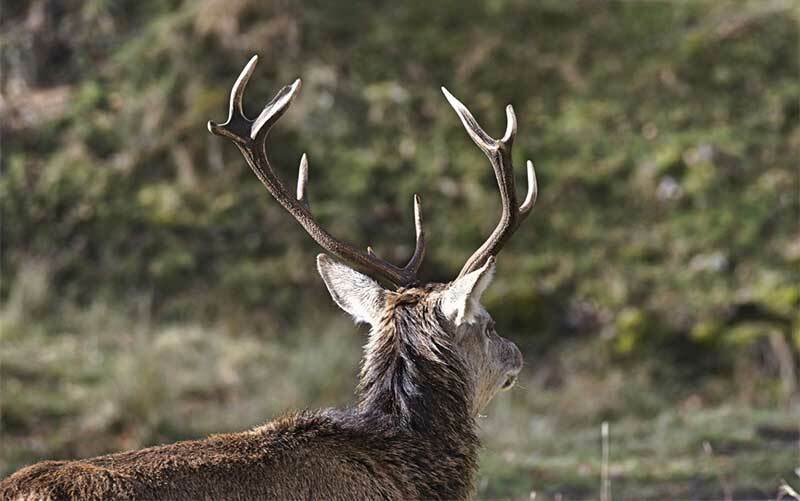 During the rut male deer may move at odd hours or will often be constantly on the move. Bucks become easily distracted during this period and their patterns—if you can even call them that—will change almost daily. In the late fall, both the male and female deer are known to continue some of this erratic behavior before settling back into their mid-fall cycle. However, because the food is less plentiful in late fall, it becomes more valuable. Thus, deer may roam for food at odd times that break their mid-fall cycle as they try to fatten up for the winter. Winter is a time of scarcity, which means deer will have to cover more ground on a daily basis just to get enough to eat. During this period you can usually throw schedules out the window, because the deer will generally try to feed when it’s warmest, even if that means feeding in the middle of the day. These patterns will continue until spring blooms once again, signaling a time of abundance. As you can see, the best time to hunt deer will largely depend on the season in which you are hunting. During the fall, however, when hunters are most active, both the early morning—when deer are lethargic—and the hours just before dusk are both known as prime hunting times because deer will most likely be feeding at these times. However, you cannot simply overlook other times of the day, such as when deer wake up from their late morning siesta at about Noon or 1:00 PM and begin to graze. If you are patient enough to stick to your tree stand for just a little while longer, it just might be at one of these less-hunted hours that you finally take that trophy buck.